Facial Rejuvenation Dry Needling uses tiny intra-dermal needles to create micro traumas that can facilitate the production of collagen and elastin. 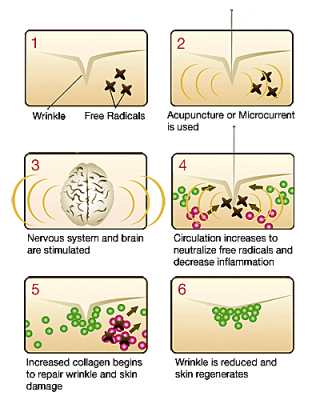 The needles are inserted inside the wrinkle or crease to bring increased nutrients, via the blood and energy, to that specific area. According to the latest research in dermatology and Dr. Howard Murad, a professor of dermatology at UCLA and Vogue magazines proclaimed “One of America’s top dermatologists”, the problem is free radicals. Aging skin …wrinkles, sagging, enlarged pores, puffiness, thin and dry skin…is due to the damaged caused by free radicals. Free radicals are destructive molecules. They destroy the integrity of other molecules. They first attack and destroy the walls of your skin cells. So if you imagine your cells as being like a water balloon. Free radicals are like a knife that pokes holes into it. The balloon will then leak like a sieve…and your cells become dehydrated. They become deflated and dehydrated, because all the vital fluid and nutrients have leaked out. Facial Rejuvenation helps restore the integrity of your skin cells by stimulating the nervous, circulatory and hormonal systems to boost collagen and elastin production. Facial Rejuvenation is a safe and effective alternative to the more invasive therapies such as BOTOX, RESTYLANE, RESURFACING, CHEMICAL PEELS or even COSMETIC SURGERY. ++ Collagen is a protein produced by our bodies that is responsible for our skin’s durability and resilience. Elastin is responsible for the elasticity of our skin. Sun exposure and aging degrade and decrease the production of our collagen and elastin. Acupuncture helps to stimulate the body’s natural processes of cell reproduction and growth. Needles are also placed in the muscle motor points to re-educate the muscles back to their original placement, thus the face looks more sculpted, more youthful and lifted. How long does Facial Acupuncture last? It’s kind of like a snowball, the more you do it the better it looks – this is particularly true in the beginning. This is why most Facial Acupuncturists usually require a patient to commit to 10-12 sessions in order to see results. Age, genetic makeup, diet, and lifestyle can affect how long the effects of a treatment will last. We are a stockist of The Jojoba Company range of skin care products. The Jojoba Company is an Australian company offering hypoallergenic, naturally grown Jojoba plant to produce safe and effective skin range. Their products do no contain harmful detergents, chemicals or parabens. NO artificial fragrances or colours. NO PEGs, mineral oil or sodium lauryl sulphate. NO animal products.